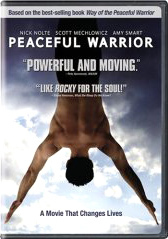 It took over twenty years for producer David Welch to find an independent studio willing to take a chance on this challenging adaptation of Way of the Peaceful Warrior. I’m also grateful to Sobini Films studio head Mark Amin, and Sobini president and producer Cami Winikoff, and others willing to invest considerable time and money into making this movie a reality. Although the film covers only the first two-thirds of the book, down-sizing a quest for enlightenment to the evolution of a young athlete, it still manages to capture some of the spirit of, and reminders from, the original story. Overall, I’m pleased with the effort. While the producers, screenwriter and director made some different choices than I might have made, I liked many of their choices — for example, resolving the robbery scene through non-violent humor. Since I had, like most authors, no control over choice of director or actors, nor any real influence over the script, the project was an education in letting go and supporting the dedicated professionals in this most collaborative of art forms. To his credit, director Victor Salva improved upon earlier drafts of the script — and seamlessly incorporated about ten pages of material I had written only a few weeks before photography). If you wish to more deeply understand (and live) with a peaceful heart and warrior spirit, I encourage you to read my other core teaching books, including Wisdom of the Peaceful Warrior, an essential companion to my first book. Together, my books provide a comprehensive course in the peaceful warrior’s way. In closing, the Peaceful Warrior movie has been a blessing for me, the author, and for filmgoers who enjoy “cinema with substance,” searching for reminders about what’s really important in life. Thank you so very much for the movie…I had not read the book, and now will. My husband took me…no words to express my deep gratitude on so many levels. I called friends and will be taking them to see Peaceful Warrior. A friend and I saw the movie Saturday night and both enjoyed it a lot. You were very fortunate to wind up with Victor Salva. I thought he got the mysticism across really well and found a lot of poetry. I loved the movie; the casting was perfect! Later, I saw Ebert and Roeper’s review of the movie and thought the Miyagi comparison showed how far off they were in their understanding of the film. It was interesting to me to see how shallow their review was. Roeper was all cerebral and heartless, Ebert started to get in touch with his feelings about it but fell short. . .
Just saw the movie and loved it. I was concerned that it wouldn’t stay true to the book but it really did. Thank you so much for all of your hard work and . . . letting people get your message of hope. Congratulations on a fantastic movie. Three friends and I went to see it today. We so enjoyed it! It was so well done and we both teared up at the end. What a difference it is going to make in the world to have such a beautiful movie with such great teachings, so simple yet so profound. I want to take my son to see it too when he’s finished with school. Wow, this film will be big! It is a high-quality movie – the best spiritual cinema genre film I have seen yet. I wouldn’t be surprised if “Peaceful Warrior” becomes a significant turning point in getting Hollywood to pay attention to this genre. It will inspire a great many people to begin thinking about what is clogging their own minds.